Opel has said it will end car production at its Bochum manufacturing plant in Germany in 2016 after production of its Zafira Tourer car ends. General Motors' European subsidiary said the decision was a response to a slump in car sales in Europe. The decision might help safeguard the future of Opel's Ellesmere Port plant in the UK, where it trades as Vauxhall. Opel employs 3,300 people at the Bochum plant, though some jobs might be saved. The carmaker said it might manufacture components at the plant after 2016, and that its warehouse in Bochum will remain operational. GM estimates it stands to lose more than $1.5bn (£935m; 1.2bn euros) on its European operations this year. It aims to return Opel and Vauxhall to profit by 2015, but the brands are heavily dependent on the European market where industry wide new car sales fell by 7.3% in the first 10 months of the year, according to data from the European Automobile Manufacturers' Association. Talks with the unions about closing Bochum, which is one of Opel's four manufacturing plants in Germany, had been taking place since June. "Despite rigorous efforts, there was no success in changing the situation," Opel said in a statement. "The main reasons are the dramatic declines in the European car market and the enormous overcapacity in the entire European auto industry." Opel has decided it needs to reduce its manufacturing capacity in Europe, having lost money 12 years running. 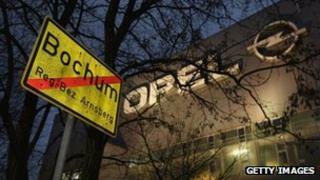 Bochum is one of Opel's four manufacturing plants in Germany, where it employs some 20,000 people. "It's a severe blow that affects a lot of people and their families and the Bochum region as well," said government spokesman Georg Streiter. "The German government ... has the expectation that the parent company General Motors will do everything possible to find socially acceptable solutions." A union official representing the workers at the Bochum plant said they had not given up the fight. "We have at least four years to make clear that we want to continue building cars in the following years," said Rainer Einenkel, head of the factory's employee council.